Danbury’s Ben LeBlanc, top, and New Milford’s Luke Schell wrestle in the 113-pound class during the match at New Milford High School on Saturday. LeBlanc won by decision. 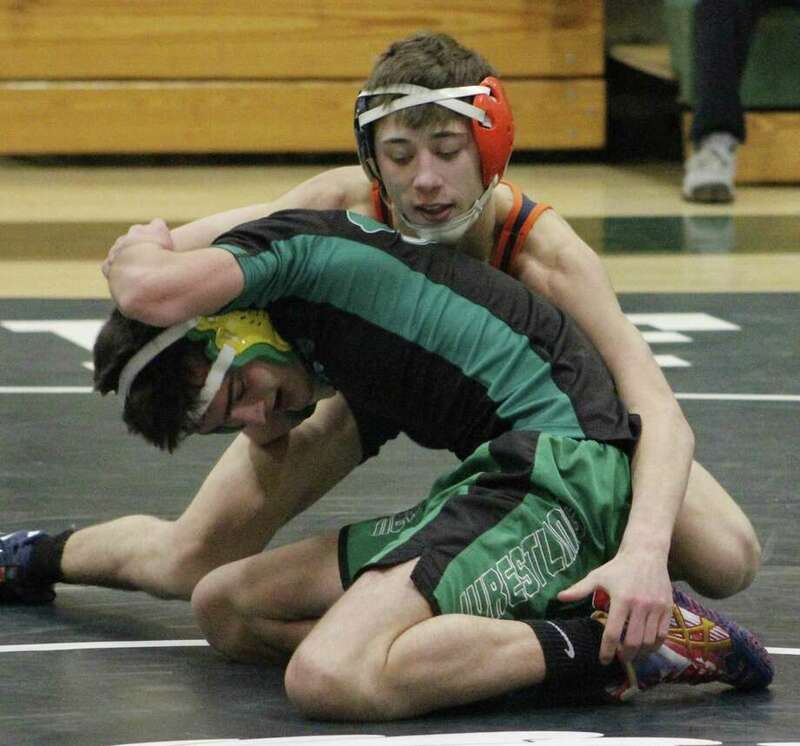 NEW MILFORD — In the past two decades, the New Milford High School wrestling team is one of the very few teams in Connecticut that has been able to hang with mighty Danbury in a dual meet. A fierce but friendly rivalry has developed between the two perennial powerhouses, which have fought some epic mat battles over the years. The clash on Feb. 3 in front of several hundred spirited fans was the latest of those epic battles. Of the 14 matches, each team won seven, with top-ranked Danbury squeaking out a 33-31 victory over sixth-ranked New Milford. New Milford trailed by five points entering the 285-pound match — the final bout of the day — and needed a pin to win or a victory by technical fall to tie. The Green Wave sent Mike Haggerty — ordinarily their starter at 220 pounds — to face Danbury’s Jordan Agosto. Haggerty won a 1-0 decision, courtesy of an escape in the opening seconds of the second period, but Agosto smartly avoided being pinned to secure the win for the Hatters. Tyler Johnson (106 pounds), A.J. Kovacs (152) and Gino Baratta (170) all won by pin for Danbury, while Kyle Fields (132) won by tecnical fall, Ryan Jack (120) by major decision and Ben LeBlanc (113) and Osbey (220) by decision. Vincent Rago (145), Lorenzo Pusateri (182) and Kyle Fabich (195) all won by pin for New Milford, while Richie Morrell (160) won a major decision and Mel Ortiz (126), Tyler Schultz (138) and Haggerty (285) all winning by decision. New Milford was the last Connecticut team to beat Danbury in a dual meet back in 2015. The Green Wave had also beaten the Hatters in 2009 to snap their streak of consecutive victories against in-state opponents at 262. Danbury’s current in-state streak is 39. Fabich’s first-period pin at 195 trimmed New Milford’s deficit to 30-28 with two matches remaining. Danbury had never trailed, but this was as close as New Milford had been all afternoon. The Hatters needed a win to reclaim the momentum, which had swung entirely in New Milford’s favor. Osbey provided that win with a hard-fought, 3-2 vicory over Julian Reza in the 220-pound clash. Osbey led 3-1 after two periods, but an escape by Reza early in the third made it 3-2. Osbey held on from there, and three team points he earned proved to be vital to the Hatters’ win. Danbury’s Jakob Camacho wrestled his first match of the season after having been sidelined with an injury. He and Ortiz — a pair of electrifying seniors, two of the best in New England — fought an exciting battle at 126, with Ortiz winning with a takedown in the first overtime period, 6-4. The Hatters were certainly happy to see Camacho back in action. (at New Milford) 106: Tyler Johnson (D) pinned Joanne Ortiz 3:22; 113: Ben LeBlanc (D) dec. Luke Schell 4-2; 120: Ryan Jack (D) major dec. Brandon Leonard 14-5; 126: Mel Ortiz (NM) dec. Jakob Camacho 6-4, OT; 132: Kyle Fields (D) tech. fall Colin Lindner 16-1; 138: Tyler Schultz (NM) dec. A.J. Caba 3-2, OT; 145: Vincent Rago (NM) pinned Chris Palacio 4:50; 152: A.J. Kovacs (D) pinned Nick Romandi 2:47; 160: Richie Morrell (NM) major dec. David Pina 11-3; 170: Gino Baratta (D) pinned Isaac Chamreun 0:55; 182: Lorenzo Pusateri (NM) pinned George Estevez 4:49; 195: Kyle Fabich (NM) pinned D.J. Donovan 1:16; 220: Monty Osbey (D) dec. Julian Reza 3-2; 285: Mike Haggerty (NM) dec. Jordan Agosto 1-0. Records: Danbury 11-3; New Milford 7-1.